REMEMBER STRESS IS THE BIGGEST KILLER OF WILDLIFE. Don’t forget the wombat will not be used to your environment. The first 24 hours are critical. 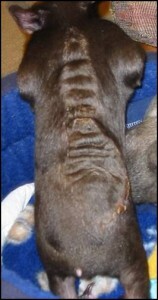 Delays can mean these injuries are not treatable and may lead to euthanasia. Get as much information as possible from the rescuer/transporter or member of the public. When – was the joey orphaned? Where – was the joey found? How long – has the joey been on it’s own? Compare – limbs etc. swelling may indicate a break, heat may point to infection. 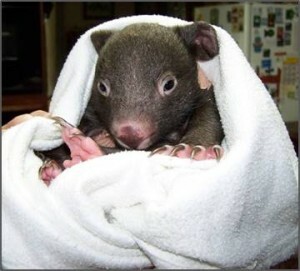 Get to know your wombat, what is normal, what is not. This comes with experience, so seek help if uncertain. Look for injuries – however small. They may be an indication of something bigger! 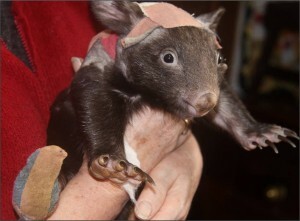 When this little wombat arrived at the shelter she was very agitated and unsettled. It was obvious she was suffering from stress. After consultation with the rescuer it was determined the joey had been orphaned the night before but was not discovered until the following day. 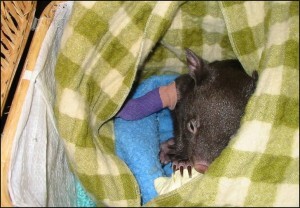 A quiet environment, snug pouch and fluids did nothing to calm this little wombat. As the hours went by it was evident that something was drastically wrong. Left alone she was frantic and calling out and could not be consoled. After careful examination all that could be seen was a red mark showing through the fur on her back. This was only visible in direct light. It was days later it was established she had 3rd degree burns. 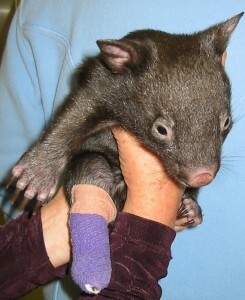 How the little wombat sustained the injury is unknown. She was found on a dead end road outside the last property. The residents had heard an engine motor late that evening and saw the dead wombat the following morning but it wasn’t until late in the afternoon before the joey was discovered trying to get back into her dead mothers pouch. Was it boiling water from a car radiator? 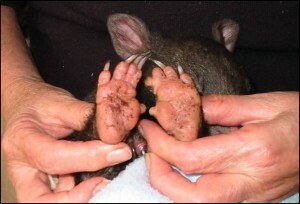 A joey of this size would have been in the pouch and the area burnt on her body, could have been exposed. It was originally thought the joey might have had an allergic reaction to nettles or something in the grass and it wasn’t until days later the extent of the injury became evident. The wound needed to be cleaned and dressed every 3 days and this had to be done under a light anesthetic due to the severity of the wound. 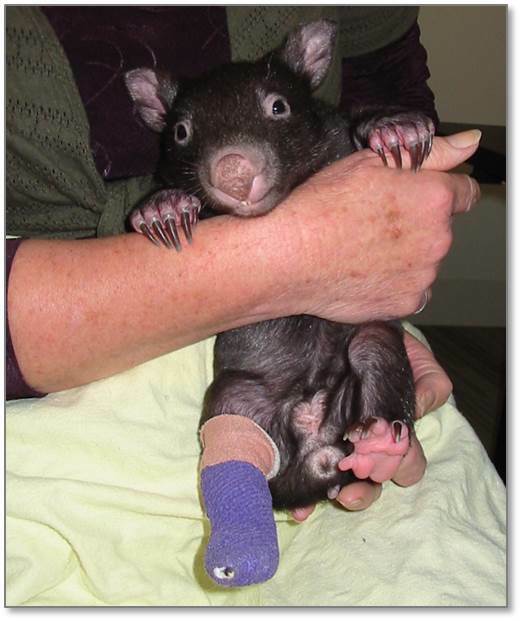 It was a slow process but once more with lots of TLC and careful handling and expert treatment by the veterinary staff at the Australian Wildlife Health Centre at Healesville Sanctuary, this little wombat made a full recovery. She did however retain some scars from her ordeal. These need to be dealt with as soon as possible (in the first day or two, not weeks later). Remember the trauma of being orphaned will be an ordeal and if an injury has occurred this will be very stressful. Examine the joey sitting on your knee in the security of it’s new pouch. A full examination can be done over a number of hours. If the joey is very stressed just a few minutes each time. Check eyes. Is there any rapid eye movement? (this may indicate head trauma). If a joey circles (walks) in one direction only, this can be an indication of head trauma and may not be picked up for quite few days. Compare limbs. Do they look the same? Is there any swelling, heat? Looks for open wounds? puncture wounds are sometimes hidden by the fur and not picked up until days later when an offensive smell becomes evident. Wounds like this will need antibiotics to clear up infection. Check with an experienced wombat carer local vet or the Australian Wildlife Health Centre at Healesville Sanctuary (Ph:5957 2829). If the joey is furred it should be able to stand (weight bare). Sit on a blanket on the floor and stand the joey up (do not move away). The joey will be anxious to get back into it’s pouch so have this close by and ready to offer. Carefully watch how the joey moves if it is unable to weight bare on it’s legs this could indicate a break or dislocation and an x-ray will be required. Swelling is also an indication of a fracture or dislocation. 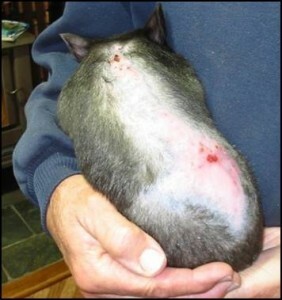 This type of injury needs to be seen to as soon as possible after the joey has settled (24 – 48 hours). Always seek help if unsure. Joeys with this type of injury need to be kept in a confined space where they can’t climb or fall. Teeth grinding in a new orphan may indicate pain. Scarlett’s mother had been shot and killed and little Scarlett had been left to survive on her own. Luckily she was found by a lady walking her dog and taken to the local vet. 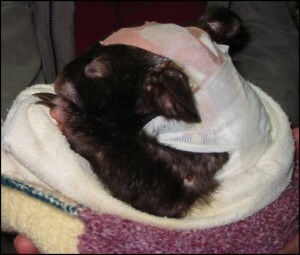 The joey was suffering terrible puncture and tear wounds possibly inflicted by a fox. Antibiotics were needed to clear up the infection and weeks of wound cleaning and bandage changes were needed and had to be done under a light anesthetic. 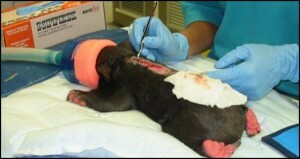 As the wounds began to heal the joey was buddied with another orphan of similar circumstances. The company of a buddy enabled Scarlett to make a full recovery and eventually she was rehabilitated and released. Stress factors can act as triggers to increase susceptibility. Handling or disturbance by strangers. Extremes of weather. Wind, Rain, Heat & Cold. Changes in Diet – any new foods must be introduced gradually. What is Coccidiosis: The egg or oocyst is ingested by the animal as it grazes. After ingesting the oocyst the protozoan invades the intestine wall by burrowing in and produces a massive population explosion . This prevents the intestine from absorbing anything that passes through. Fluids are also able to pass through the damaged lining back into the gut and are lost from the body. This causes dehydration and shock. The damaged lining passes out as bloody looking diarrhoea. Whilst this is all going on inside your joey the last thing it feels like is milk (just as you don’t like milk on an upset stomach). If the joey will drink milk by all means give it milk, it needs all the goodness it can get. It is important to get the joey to take fluids (electrolytes) as often as possible and intravenous fluids may also be needed. • Chronic diarrhea is usually evident in the later stages. 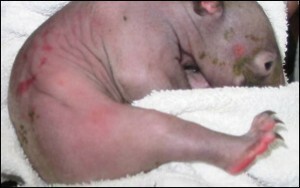 The infected animal dies of dehydration, due to the fluid loss and of shock caused by extreme pain. Fluids are extremely important for survival (electrolytes), as well as pain management. Warmth is also necessary so make sure the joey is snug and secure. • Seek expert advice immediately as a course of medication will be needed. • Baycox or Ponazuril (Bayer) are products that are used to treat Coccidiosis. These medications are being used off label and care has to be taken that the right dose rate is prescribed. 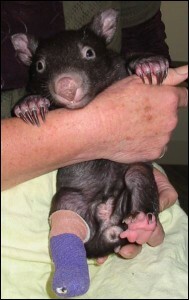 If overdosing occurs the wombat will die. 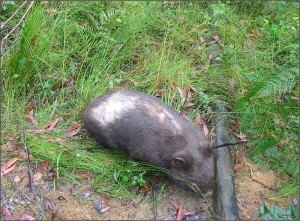 Wombats have a slow moving gut so overdosing can easily occur. Do not treat at the same dose rate as for a kangaroo (a much faster moving gut). 0.4ml per kg body weight taken on first day and then repeated again in 5-7 days time. This is usually enough to kill the oocysts. 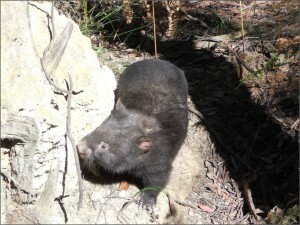 The wombat will take a few weeks to build up body weight and strength and fluids should be offered continually while the diarrhoea is present. PREVENTION: It is important to be aware of STRESS at all times. 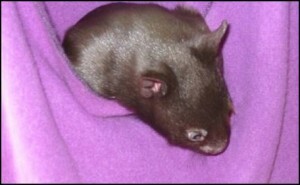 Any move to a new enclosure or the introduction of a buddy should be done slowly and under supervision. There may not be any indication of sickness for 3 – 6 weeks. If you are taking an orphan from another carer find out how it has been housed, how it takes it’s bottle, how confident or shy it is. This information will help you to minimize stress. Enclosures need to be cleaned daily and food should not be fed on the ground but in containers. Do not house your wombat with ducks, hens, geese etc. as birds are also carriers and are constantly defecating on the ground making it very hard to keep an enclosure clean.